Report of 12 anti-Semitic Facebook accounts run by UNRWA officials was issued to UN chief Ban Ki Moon, who is urged to fire the culprits. The UN Watch non-governmental organization reports that UNRWA officials operate no fewer than 12 different Facebook accounts that openly incite to violence and hatred against Jews. The group submitted a report on Thursday to United Nations Secretary- General Ban Ki-moon, urging him yet again to fire the culprits, pursuant to his promises. 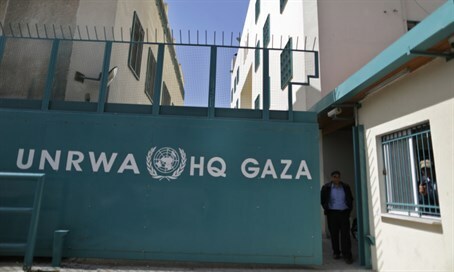 UN Watch also reported that the response of UNRWA spokesman Chris Gunness has been to lash out against the NGO. Gunness even asked via Twitter for information on UN Watch's "political and financial affiliations" or "annual reports." Gunness has also tweeted that the allegations of UNRWA's anti-Semitism are a "non-story," and that UN Watch lacks credibility and has made a "fool of itself." Sample cartoons on UNRWA officials' Facebook accounts include "Israel" sitting down to cut up a meal of a young Arab, with a United States fork and unidentified knife, with a cup of what looks like blood alongside the plate. Another cartoon shows a Jew hiding behind a tree, as depicted in a famous Quran passage, with a gun-toting Arab seeking to kill him; the text calls for the murder of Jews. The United States provides some 40% of UNRWA's billion-dollar budget. In 2nd place is the European Union, which gives $139 million, followed by the United Kingdom and Sweden - $95 million and $80 million, respectively. UN Watch called on the above and other countries to "stop UNRWA from using taxpayer funds to employ school principals and teachers who spread anti-Semitism and terrorism. Inaction is complicity." Hillel Neuer, executive director of UN Watch, said, “The pattern and practice of UNRWA school principals, teachers and staff members posting anti-Semitic and terror-inciting images suggests a pathology of racism and violence within UNRWA that must be rooted out, not buried, as UNRWA spokesman Chris Gunness has attempted to do by calling for boycotts of newspapers or NGOs that report these incidents of hate." The Geneva-based UN Watch monitors the performance of the United Nations by the yardstick of its own charter. The independent group was established in 1993 under the chairmanship of the late Morris B. Abram, a pioneer civil rights leader with Rev. Martin Luther King, Jr., and and former US ambassador to the UN in Geneva.